Thiagavel, J., Santana, S. E. & Ratcliffe, J. M. (2017). Body size predicts echolocation call peak frequency better than gape height in vespertilionid bats. Sci. Rep. 7, 828. Fenton, M. B. & Ratcliffe, J. M. (2017). Sensory biology: bats united by cochlear development. Nature Ecol. Evol. 1, 1-2. Patriquin, K. & Ratcliffe, J. M. (2016). Should I stay or should I go? Fission-fusion dynamics in bats. In Sociality in Bats (Ortega, J., Ed. ), pp. 65-103. Berlin: Springer-Verlag. Jones, P. L., Page, R. A. & Ratcliffe, J. M. (2016). To scream or to listen? Echolocation and passive listening in animal-eating bats. In Bat Bioacoustics, Springer Handbook of Auditory Research (Fenton, M. B., Grinnell, A. D., Popper, A. N. & Fay, R. R., Eds. ), pp. 93-116. Berlin: Springer-Verlag. Hulgard, K. & Ratcliffe, J. M. (2016). Sonar sound groups and increased terminal buzz duration reflect task complexity in hunting bats. Sci. Rep. 21500. Wisniewska, D. M., Ratcliffe, J. M., Beedholm, K., Christensen, C. B., Johnson, M., Koblitz, J. C., Wahlberg, M. & Madsen, P. T. (2015). Range-dependent flexibility in the acoustic field of view of echolocating porpoises (Phocoena phocoena). eLife e05651. Fawcett, K. & Ratcliffe, J. M. (2015). Clutter and conspecifics: a comparison of their influence on echolocation and flight behavior in Daubenton's bat, Myotis daubentonii. J. Comp. Physiol. A 201, 295-304. Fenton, M. B. & Ratcliffe, J. M. (2014). Sensory biology: echolocation from click to call, mouth to wing. Curr. Biol. 24, R1160–R1162. Hulgard, K. & Ratcliffe, J. M. (2014). Niche-specific cognitive strategies: object memory interferes with spatial memory in the predatory bat, Myotis nattereri. J. Exp. Biol. 217, 3293-3300. Clarin, T.M.A., Borissov, I., Page, R.A., Ratcliffe, J.M. & Siemers, B.M. (2014). Social learning within and across species: information transfer in mouse-eared bats. Can. J. Zool. 92, 129–139. Brinkløv, S., Fenton, M. B. & Ratcliffe, J. M. (2013). Echolocation in Oilbirds and swiftlets. Front. Physiol. 4, 123. Ratcliffe, J. M., Elemans, C. P. H., Jakobsen, L. & Surlykke, A. (2013). How the bat got its buzz. Biol. Lett. 9, 1-5. Jakobsen, L.,Ratcliffe, J. M. & Surlykke, A. (2013). Convergent acoustic field of view in echolocating bats. Nature 493, 93-96.
ter Hofstede, H. M., Goerlitz, H. R., Ratcliffe, J. M., Holderied, M. W. & Surlykke, A. (2013). The simple ears of noctuid moths are tuned to the calls of their sympatric bat community. J. Exp. Biol. 216, 3954-3962. Fenton, M. B., Faure, P. A. & Ratcliffe, J. M. (2012). Evolution of high duty cycle echolocation in bats. J. Exp. Biol. 215, 2935-2944. Ratcliffe, J. M., Fullard, J. H., Arthur, B. J. & Hoy, R. R. (2011). Adaptive auditory risk assessment in the dogbane tiger moth when pursued by bats. Proc. R Soc. B 278, 364-370. Brinkløv, S., Jakobsen, L., Ratcliffe, J. M., Kalko, E. K. V. & Surlykke, A. (2011). Echolocation call intensity and directionality in flying short-tailed fruit bats, Carollia perspicillata (Phyllostomidae). J. Acoust. Soc. Am. 129, 427-435. McGuire, L. P. & Ratcliffe, J. M. (2011). Light enough to travel: migrating bats have smaller brains, but not larger hippocampi, than sedentary species. Biol. Lett. 7, 233-236. Ratcliffe, J. M., Jakobsen, L., Kalko, E. K. V. & Surlykke, A. (2011). Frequency alternation and an offbeat rhythm indicate foraging behavior in the echolocating bat, Saccopteryx bilineata. J. Comp. Physiol. A 197, 413-423. Elemans, C. P. H., Mead, A. F., Jakobsen, L. & Ratcliffe, J. M. (2011). Superfast muscles set maximum call rate in echolocating bats. Science 333, 1885-1888. Ratcliffe, J. M. & Fawcett, K. (2010). Ecological and behavioural methods for the study of bats, 2nd edition (Kunz, T. H. & Parsons, S., Eds), Baltimore: Johns Hopkins University Press, 2009. 901 pp. Anim. Behav. 80, 343. Fenton, M. B. & Ratcliffe, J. M. (2010). Bats. Curr. Biol. 20, R1060-R1062. Fullard, J. H., ter Hofstede, H. M., Ratcliffe, J. M., Pollack, G. S., Brigidi, G. S., Tingahella, R. M. & Zuk, M. (2010). Genetic distance and sensoribehavioural regression in the Pacific field cricket, Teleogryllus oceanicus. Naturwissenschaften 97, 53-61. Carter, G. G., Ratcliffe, J. M. & Galef, B. G. (2010). Flower bats (Glossophaga soricina) and fruit bats (Carollia perspicillata) rely on spatial cues over shapes and scents when relocating food. PLoS One 5, e10808. Dukas, R. & Ratcliffe, J. M. (2009). Prospects. 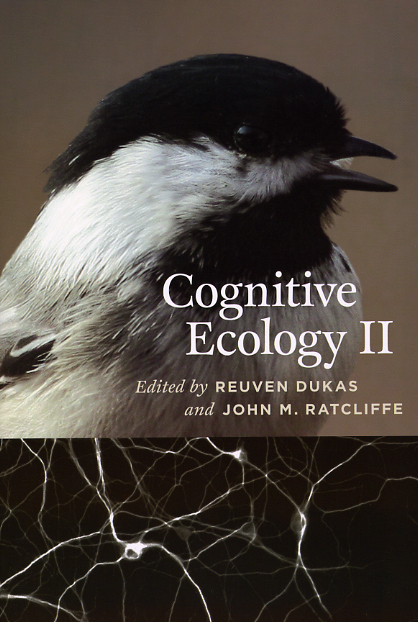 In Cognitive Ecology II (Dukas, R. & Ratcliffe, J. M., Eds), pp. 298-300. Chicago: University of Chicago Press. Ratcliffe, J. M. (2009). Predator-prey interaction in an auditory world. In Cognitive Ecology II (Dukas, R. & Ratcliffe, J. M., Eds), pp. 201-225. Chicago: University of Chicago Press. Dukas, R. & Ratcliffe, J. M. (2009). Introduction. In Cognitive Ecology II (Dukas, R. & Ratcliffe, J. M., Eds), pp. 1-4. Chicago: University of Chicago Press. Dukas, R. & Ratcliffe, J. M., Editors. (2009). Cognitive Ecology II. Chicago: University of Chicago Press. 400 pp. Ratcliffe, J. M. (2009). Neuroecology and diet selection in phyllostomid bats. Behav. Proc. 80, 247- 251. Riskin, D. K., Bahlman, J. W., Hubel, T. Y., Ratcliffe, J. M., Kunz, T. H. & Swartz, S. M. (2009). Bats go head-under-heels: the biomechanics of landing on a ceiling. J. Exp. Biol. 212, 945-953. Ratcliffe, J. M., Fullard, J. H., Arthur, B. J. & Hoy, R. R. (2009). Tiger moths and the threat of bats: decision-making based on the activity of a single sensory neuron. Biol. Lett. 5, 368-371. Fullard, J. H., Ratcliffe, J. M. & Jacobs, D. S. (2008). Ignoring the irrelevant: auditory tolerance of audible but innocuous sounds in the bat-detecting ears of moths. Naturwissenschaften 95, 241-245. Ratcliffe, J. M., Guignion, C., Muma, K. E., Soutar, A. R. & Fullard, J. H. (2008). Anti-bat flight activity in sound-producing versus silent moths. Can. J. Zool. 86, 582-587.
ter Hofstede, H. M., Ratcliffe, J. M. & Fullard, J. H. (2008). Nocturnal activity positively correlated with auditory sensitivity in eared moths. Biol. Lett. 4, 262-265. Mandel, J. T., Ratcliffe, J. M., Cerasale, D. & Winkler, D. W. (2008). Laterality and flight: concurrent tests of side-bias and optimality in flying tree swallows. PLoS One 3, e1748. Jacobs, D. S., Ratcliffe, J. M. & Fullard, J. H. (2008). Beware of bats, beware of birds: the auditory responses of eared moths to bat and bird predation. Behav. Ecol. 19, 1333-1342. Ratcliffe, J. M. & Nydam, M. L. (2008). Multimodal warning signals for a multiple predator world. Nature 455, 96-99.
ter Hofstede, H. M., Ratcliffe, J. M. & Fullard JH. (2008). The effectiveness of katydid (Neoconocephalus ensiger) song cessation as antipredator defence against the gleaning bat Myotis septentrionalis. Behav. Ecol. Sociobiol. 63, 217-226. Fullard, J. H., Ratcliffe, J. M. & ter Hofstede, H. M. (2007). Neural evolution in the bat-free habitat of Tahiti: partial regression in an anti-predator auditory system. Biol. Lett. 3, 26-28. Fullard, J. H., Ratcliffe, J. M. & Christie, C. G. (2007). Acoustic feature discrimination in the dogbane tiger moth Cycnia tenera. J. Exp. Biol. 210, 2481-2488. Ratcliffe, J. M. & Fenton, M. B. (2006). Animal behavior: who will croak next? Curr. Biol. 16, R455-R456. Ratcliffe, J. M., Fenton, M. B. & Shettleworth, S. J. (2006). Behavioral flexibility positively correlated with relative brain volume in predatory bats. Brain Behav. Evol. 67, 165-176. Ratcliffe, J. M. & ter Hofstede, H. M. (2005). Roosts as information centres: social learning of food preferences in bats. Biol. Lett. 1, 72-74. Ratcliffe, J. M., Raghuram, H., Marimuthu, G., Fullard, J. H. & Fenton, M. B. (2005). Hunting in unfamiliar space: echolocation in the Indian false vampire bat, Megaderma lyra, when gleaning prey. Behav. Ecol. Sociobiol. 58, 157-164. Fullard, J. H., Ratcliffe, J. M. & Guignion, C. (2005). Sensory ecology of predator-prey interactions: responses of the AN2 interneuron in the field cricket, Teleogryllus oceanicus to the echolocation calls of sympatric bats. J. Comp. Physiol. A 191, 605-618. Ratcliffe, J. M. & Fullard, J. H. (2005). The adaptive function of tiger moth clicks against echolocating bats: an experimental and synthetic approach. J. Exp. Biol. 208, 4689-4698. Fenton, M. B. & Ratcliffe, J. M. (2004). Animal behaviour: eavesdropping on bats. Nature 429, 612-613. Fullard, J. H., Ratcliffe, J. M. & Soutar, A. R. (2004). Extinction of the acoustic startle response in moths endemic to a bat-free habitat. J. Evol. Biol. 17, 856-861. Ratcliffe, J. M., ter Hofstede, H. M., Avila-Flores, R., Fenton, M. B., McCracken, G. F., Biscardi, S., Blasko, J., Gillam, E., Orprecio, J. & Spanjer, G. (2004). Conspecifics influence call design in the Brazilian free-tailed bat, Tadarida brasiliensis. Can. J. Zool. 82, 966-971. Biscardi, S., Orprecio, J., Fenton, M. B., Tsoar, A. & Ratcliffe, J. M. (2004). Data, sample sizes and statistics affect the recognition of bats by their echolocation calls. Acta Chiropterol. 62, 347-363. Ratcliffe, J. M. (2003). Myotis welwitschii. Mamm. Species 701, 1-3. Ratcliffe, J. M., Fenton, M. B. & Galef, B. G. (2003). An exception to the rule: common vampire bats do not learn taste aversions. Anim. Behav. 65, 385-389.
ter Hofstede, H. M., Miller, J., Ratcliffe, J. M. & Fenton, M. B. (2003). A healed fractured radius in a flying big brown bat (Eptesicus fuscus). J. Wildlife Rehabil. 26, 4-7. Ratcliffe, J. M. & Dawson, J. W. (2003). Behavioural flexibility: the little brown bat, Myotis lucifugus, and the northern long-eared bat, M. septentrionalis, both glean and hawk prey. Anim. Behav. 66, 847-856. Fenton, M. B., Taylor, P. J., Jacobs, D. S., Richardson, E. J., Bernard, E., Bouchard, S., DeBaeremaeker, K. R., ter Hofstede, H., Hollis, L., Lausen, C. L., Lister, J. S., Rambaldini, D., Ratcliffe, J. M. & Reddy, E. (2002). Researching little-known species: the African bat Otomops martiensseni (Chiroptera: Molossidae). Biodiversity Conserv. 11, 1583-1606. Fenton, M. B., Bernard, E., Bouchard, S., Hollis, L., Johnston, D., Lausen, C., Ratcliffe, J. M., Riskin, D. K., Taylor, J. R. & Zigorus, J. (2001). The bat fauna of Lamanai, Belize: roosts and trophic roles. J. Trop. Ecol. 17, 511-524.